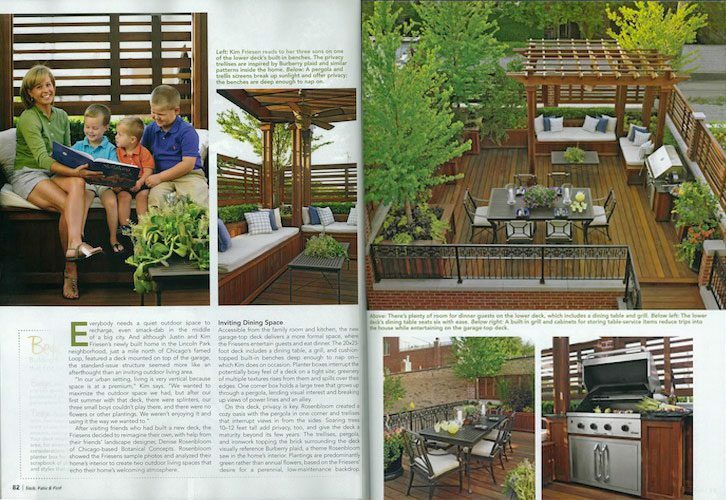 This Chicago family replaces one blasé deck with two beautiful spaces: one for family, one for fun. Everybody needs a quiet outdoor space to recharge, even smack-dab in the middle of a big city. And although Justin and Kim Friesen’s newly built home in the Lincoln Park neighborhood, just a mile north of Chicago’s famed Loop, featured a deck mounted on top of the garage, the standard-issue structure seemed more like an afterthought than an inviting outdoor living area. After visiting friends who had built a new deck, the Friesens decided to reimagine their own, with the help of their friends’ landscape designer, Denise Rosenbloom of Chicago-based Botanical Concepts. Rosenbloom showed the Friesens sample photos and analyzed their home’s interior to create two outdoor living spaces that echo their home’s welcoming atmosphere. Accessible from the family room and kitchen, the new garage-top deck delivers a more formal space, where the Friesens entertain guests and eat dinner. The 20×23-foot deck includes a dining table, a grill, and cushion-topped built-in benches deep enough to nap on – which Kim does on occasion. Planter boxes interrupt the potentially boxy feel of a deck on a tight site; greenery of multiple textures rises from them and spills over their edges. One corner box holds a large tree that grows up through a pergola, lending visual interest and breaking up views of power lines and an alley. On this deck, privacy is key. 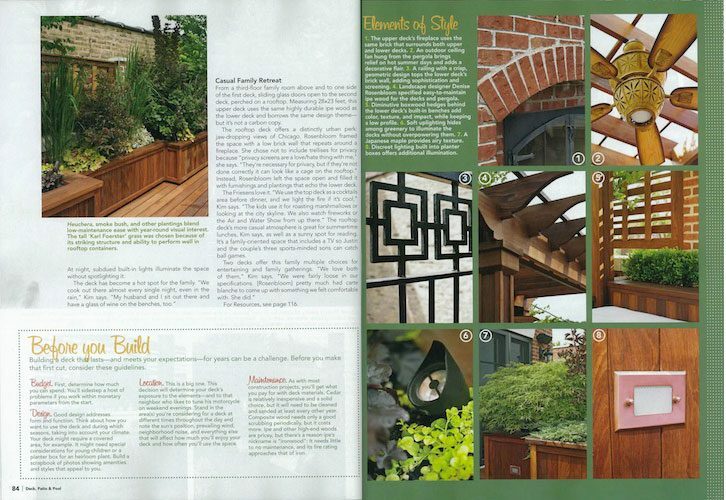 Rosenbloom created a cozy oasis with the pergola in one corner and trellises that interrupt views in from the sides. Soaring trees 10-12 feet tall add privacy, too, and give the deck a maturity beyond its few years. The trellises, pergola, and ironwork topping the brick surrounding the deck visually referenced Burberry plaid, a theme Rosenbloom saw in the home’s interior. Plantings are predominantly green rather than annual flowers, based on the Friesens’ desire for a perennial, low-maintenance backdrop. At night, subdued built-in lights illuminate the space without spotlighting it. From a third-floor family room above and to one side of the first deck, sliding glass doors open to the second deck, perched on a rooftop. Measuring 28×23 feet, this upper deck uses the same highly durable ipe wood as the lower deck and borrows the same design theme – but it’s not a carbon copy. The rooftop deck offers a distinctly urban perk: jaw-dropping views of Chicago. Rosenbloom framed the space with a low brick wall that repeats around the fireplace. She chose not to include trellises for privacy because “privacy screens are a love/hate thing with me,” she says. “They’re necessary for privacy, but if they’re not done correctly it can look like a cage on the rooftop.” Instead, Rosenbloom left the space open and filled it with furnishings and plantings that echo the lower deck. The Friesen’s love it. “We used the top deck as a cocktails area before dinner, and we light the fire if it’s cool,” Kim says. “The kids use it for roasting marshmallows or looking at the city skyline. We also watch fireworks or the Air and Water Show from up there.” The rooftop deck’s more casual atmosphere is great for summertime lunches, Kim says, as well as a sunny spot for reading. It’s a family-oriented space that includes a TV so Justin and the couple’s three sports-minded sons can catch ball games. Building a deck that lasts – and meets your expectations – for years can be a challenge. Before you make the first cut, consider these guidelines. Budget. First determine how much you can spend. You’ll sidestep a host of problems if you work within monetary parameters from the start. Design. Good design addresses form and function. Think about how you want to use the deck and during which seasons, taking into account your climate. Your deck might require a covered area, for example. It might need special considerations for young children or a planter box for an heirloom plant. Build a scrapbook of photos showing amenities and styles that appeal to you. Location. This is a big one. This decision will determine your decks exposure to the elements – and to that neighbor who likes to tune his motorcycle on weekend evenings. Stand in the area(s) you’re considering for a deck at different times throughout the day and note the sun’s position, prevailing wind, neighborhood noise, and everything else that will affect how much you’ll enjoy your deck and how often you’ll use the space. Maintenance. As with most construction projects, you’ll get what you pay for with deck materials. Cedar is relatively inexpensive and a solid choice, but it will need to be cleaned and sanded at least every other year. Composite wood needs only a good scrubbing periodically, but it costs more. Ipe and other high-end woods are pricey but there’s a reason ipe’s nickname is “ironwood”: It needs little to no maintenance, and its fire rating approaches that of iron. The upper deck’s fireplace uses the same brick that surround both upper and lower decks. An outdoor ceiling fan hung from the pergola brings relief on hot summer days and adds decorative flair. A railing with a crisp, geometric design tops the lower deck’s brick wall, adding sophistication and screening. 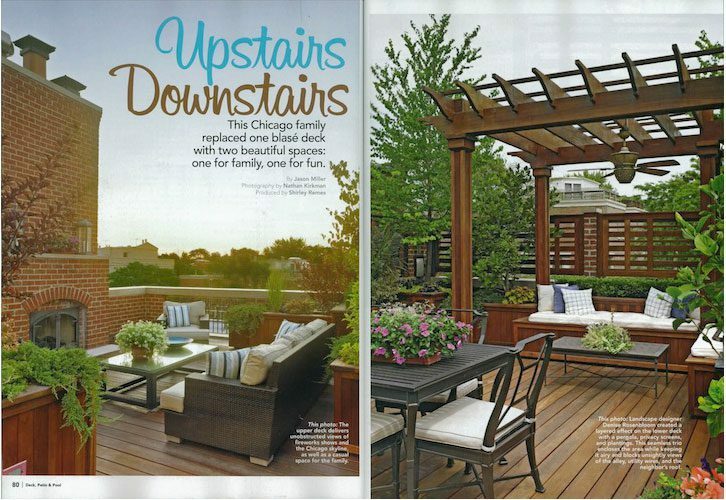 Landscape designer Denise Rosenbloom specified easy-to-maintain ipe wood for the decks and pergola. Diminutive boxwood hedges behind the lower deck’s built-in benches add color, texture, and impact, while keeping a low profile. Soft uplighting hides among the greenery to illuminate the decks without overpowering them. A Japanese maple provides airy texture. Discreet lighting built into planter boxes offers additional illumination. The upper deck delivers unobstructed views of fireworks shows and the Chicago skyline, as well as a casual space for the family. Landscape designer Denise Rosenbloom created a layered effect on the lower deck with the pergola, privacy screens, and plantings. This seamless trio encloses the area while keeping it airy and blocks unsightly views of the alley, utility wires, and the neighbor’s room. Kim Friesen reads to her three sons on one of the lower deck’s built-in benches. The privacy trellises are inspired by Burberry plaid and similar patterns inside the home. A pergola and trellis screens break up sunlight and offer privacy; the benches are deep enough to nap on. There’s plenty of room for dinner guests on the lower deck, which includes a dining table and grill. The lower deck’s dining table seats six with ease. A built-in grill and cabinets for storing table-service items reduce trips into the house while entertaining on the garage-top deck. Heuchera, smoke bush, and other plantings blend low-maintenance ease with year-round visual interest. The tall ‘Karl Foerster’ grass was chosen because of its striking structure and ability to perform well in rooftop containers.